This instrumental program provides an excellent introduction to the piano for beginners to learn basic fundamental keyboard skills. Emphasis is on note reading, ear training, composing, improvising, rhythmic skills, technique and ensemble playing. Students learn in a creative, fun filled atmosphere. 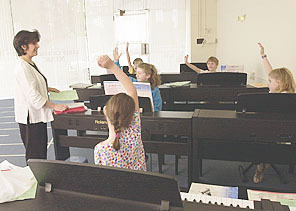 Class size is limited to eight and a keyboard/piano at home is required to practice. Designed for students ages 5-8 , this introductory course provides a relaxed introduction to piano basics. Note reading, ear training, and rhythmic skills will be developed in a creative group setting. Each student will be participating in movement activities and other group musical games. A digital lab is used, so each student is playing on his/her own piano during the class playing time. Class size is limited to eight and a keyboard/piano at home on which to practice is a prerequisite. Practice time expected is 30 min. daily. Designed for students who continue the elementary levels of piano study. Students are in groups of four, six, or eight, in which the emphasis is on rhythmic skills, composing, improvising, performing , note reading, ear training, sight reading and ensemble music. The Music Workshop Piano Club is an exciting support group for pianists 11-18 yrs. to learn about the wonderful world of piano and music. Some important parts of the club will be : making friends, discussing topics on piano playing, planning a few social events for the year, meeting other piano students and sharing ideas. Students can perform whenever they wish, and meetings will have a presentation of entertaining topics about the piano as well as an occasional guest speaker/performer. To join the club, students must be playing music that is at the early intermediate to early advanced level. The Club will meet four times per year. Dates to be announced. Call 603-226-0690 or email cherylmlaughlin@gmail.com for more infomation. All materials presented on this site are Copyright © 2015 by The Music Workshop of Concord unless otherwise noted. No material may be used in any way without prior written permission.